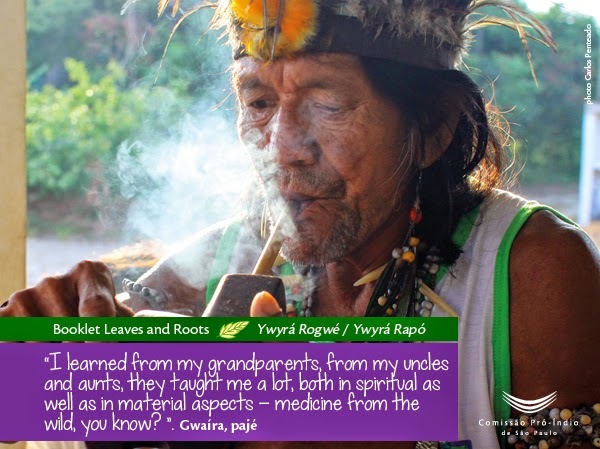 As Gwaíra, the shaman, stated, this brochure is about the “wild medicine” that the Tupi-Guarani have learned from nature and from Nhanderu, and which has been transmitted from generation to generation. But it has recently gone a little forgotten especially by the younger generation. The booklet Ywyrá Rogwé / Ywyrá Rapo: Djaroypy Djiwy Nhanémoã Nhanderekó Tupi Guarani (Plants and Roots: Rescuing traditional Tupi-Guarani’s medicine) meets a yearning brought to Pro-Indian Commission of São Paulo by the indigenous teachers of the Piaçaguera village (also known as Ywy Pyaú), Luan Elísio Apyká and Dhevan Pacheco: to publish the result of the work they had carried out with their students with the support of the txeramoi and txedjaryi (the elderly). “A few years ago one of the children of our school had a stomachache during one of the classes. We had no medications to help and no one to go to the city to buy them. Unsure of what to do, we remembered that nhimbogwé regwá wá (Macela flower) was used in the past for stomachache, so we made tea with the plant and the child got better. “After that we thought: there is a ‘natural pharmacy’ in our village; there is no reason to depend only on remedies of the white people and always go after the SESAI (Special Secretariat for Indigenous Health); specially because our parents and elders have always used medicinal plants . “Thus, we started a project in school during Tupi language classes so that this knowledge could be ‘rescued’. We invited the elders – each week one would come to pass their knowledge to the students, who knew nothing of the plants, and even their parents started to forget. And instead of taking the plants to the classroom, we organized for the elders to take the kids to where these plants were, so that they would learn where to find them. This is the first material produced by us to be published this way“, said Luan Apiká and Dhevan Pacheco. This initiative aims to rescue and value this traditional knowledge. And this is the objective of this publication: to remind the young ones of the wisdom of the Tupi-Guarani and encourage them to seek the txeramoi and txedjaryi to learn more about the “wild medicine”. This is not an exhaustive catalogue of plants known to the Tupi-Guarani, but rather a small sample of this vast knowledge, a starting point for learning and reflection. The content of the booklet is the product of a collective effort of the teachers, their students, the elderly from the Piaçaguera indigenous village and the team of the Pro-Indian Commission of São Paulo. The role of the Pro-Indian Commission was to assist in the editing of the material, to promote the photographic record of plants and enable the graphic project created by the designer team along with the indians. Such activities have been carried out with the financial support from Christian Aid, DKA Austria and Size of Wales. The Piaçaguera Indigenous Land on the south coast of São Paulo is home to about 250 Tupi-Guarani indians. Spread over five villages, they occupy an area of 2,790 hectares in the municipality of Peruibe. Piaçaguera was declared as indigenous land by FUNAI in 2011; however, until May 2014, the demarcation process had not yet been completed as the withdrawal of non-indigenous occupants from the land still needs to be made by FUNAI. The delay in the completion of the demarcation is just one of the many problems faced by the Tupi-Guarani in Piaçaguera. The land is an extremely vulnerable territory due to its proximity to the urban area, the existence of a busy road, the flow of tourists and impacts caused by over 50 years of mining activity within their lands. The Tupi-Guarani people seek alternatives to live the way they consider ideal in an environment subject to many pressures and threats. The production of this booklet is part of that quest.